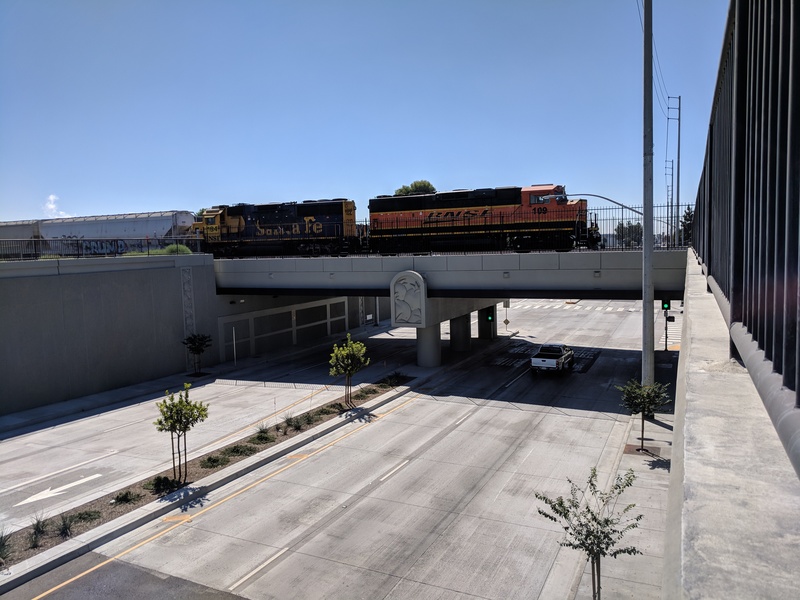 As part of the OC Bridges program, the City of Fullerton and the Orange County Transportation Authority designed and constructed a new roadway underpass at the intersection of State College Boulevard and the BNSF Railway. The roadway was lowered between Santa Fe Avenue to the north to approximately 500 feet south of Valencia Drive to the south. The tracks are carried on a 2-span 113-foot long, 60-foot wide undercrossing with concrete precast box girders and steel plate deck. The project required extensive utility coordination and relocation of 20 different facilities including water, sewer, drainage, and telecommunications. The $86 million (total project cost) underpass greatly improved safety and traffic operations at the rail line that carries more than 70 trains per day, with train lengths reaching a mile long. The State College Grade Separation was a critical infrastructure improvement that improves safety, traffic operations within the City of Fullerton, and improves the economy. The project removes the at-grade highway-railroad crossing, which has several benefits. More than 70 trains a day cross State College Boulevard and the number is projected to increase to 130 trains per day by 2030. Currently, some trains extend more than a mile long, which had blocked traffic throughout the City. With the recently constructed project, vehicle, bicycle, and pedestrian traffic is physically separated from the high train volumes. This eliminates the potential for collisions with locomotives. Individuals can travel across the tracks without risk of being hit by a train. This is critical as the grade separation is less than a mile from California State University, Fullerton and State College Boulevard serves as the main north-south connection to the university. The removal of the at-grade crossing improves traffic conditions and reduces delays. Prior to the construction of the project, the only grade separated crossing of the BNSF tracks within the southern and industrial portion of the City was the SR-57 freeway. Due to the number and length of trains, this resulted in significant delays and impacts to traffic operations. Vehicles no longer need to wait at the gates for the multitude of long trains to cross the roadway. Similarly, emergency services response times are improved with the elimination of the crossing. Lastly, the improvement in traffic operations results in improved noise and air quality. Train horn use is no longer required and idle times for vehicles waiting at the crossing gates are removed. The project improves economic vitality. The project improves business access and goods movement. The removal of the train-vehicle conflict point allows for freight traffic to move freely. This is very beneficial for the industrial and commercial land uses along the project corridor. These business include CJ Foods, UPS, FedEx, Airconic Fastening Systems, Kimberly-Clark, and numerous small commercial business and manufacturers. Delays in freight movement has significant impacts on these businesses such as increased fuel and labor costs. The grade separation improves freight and people throughput, which results in improved economic conditions. The State College Boulevard Grade Separation benefited from the excellent relationships developed between the design and construction teams, the railroad, and utilities. Coordination and approvals were required by BNSF, as the owner of the rail facility. The construction of the project couldn’t impact rail traffic and customer service. The project required close coordination with BNSF for the development of the shoofly, as well as construction sequencing. Rail construction was coordinated based upon the availability of the track machine. Additionally, the railroad was expanding from two to three tracks during the construction of the grade separation. This project continued the strong working relationship established with BNSF that was developed through the delivery of the neighboring OC Bridges projects. There was extensive coordination with local utility providers. The roadway lowering involved protecting in place or relocating 20 utilities and established a utility corridor. This required coordination with City of Fullerton utilities, Orange County Sanitation District (OCSD), Orange County Water District, SCE, Southern California Gas, and multiple telecommunication purveyors. The utility corridor included water, sewer, storm drain, and joint trench for dry utilities. One major utility that needed to relocated was the OCSD New Hope – Placentia and Cypress Trunk line, a significant sewer main that serves Fullerton and Anaheim. It was determined that the OCSD line would be combined with the City’s sewer line. The resulted in increasing the sewer from a 33-inch to a 36-inch vitrified clay pipe. The project also developed benefits for the OC Flood. The grade separation project included a 7-foot by 5-foot reinforced concrete box (RCB) for storm water storage and designed for a 100-year storm. The delayed storm water flows into the nearby Kimberly Storm Channel, owned by OC Flood. This reduced peak flows into the channel and prevented an overburdening of OC Flood facilities downstream. The State College Boulevard Grade Separation had several obstacles to overcome. The project needed to be constructed quickly to limit public inconvenience and required a solution that would allow for accelerated delivery. The project used top down construction, requiring roadway closure. Construction was phased so the north and south side conforms were built first. This reduced the footprint of the road closure. The bridge was constructed at ground level without false work. The project also constructed extensive soldier pile and Caltrans Type 1 retaining walls. The road closure occurred at the same time as the neighboring Raymond Avenue Grade Separation, which also closed the road. Both projects coordinated a detour at Acacia Avenue. All the driveways and businesses on the south side of the State College Boulevard and Valencia Avenue remained open during construction. The portion of State College Boulevard between Fender Avenue and Santa Fe Drive was opened early to reduce impacts to the public. The project encountered two challenges during construction. The project encountered unforeseen soil conditions while constructing the storm drain in the State College Boulevard/Fender Avenue Area. This made shoring of the 15- to 20-foot trench difficult. Additional bracing between plates was needed while still allowing the pipe sections to be lowered into place. The solution limited project potential project delays. The reinforcement cages for the bent columns became misaligned. When the cages were set, a partial concrete pour was added near the bottom to hold them in place. The cages moved during this process. The bottom bent bars and the shear rods were designed to fit precisely around and through the cages. The misalignment restricted the proper fitting. These columns are the main support for the midspan of the bridge and are part of the bridge that is exposed to the public. This required the solution to provide structural and seismic stability as well as be aesthetic. Additionally, this was on the critical path due to not only needing a rapid redesign to maintain the construction schedule but the calculations also needed to be reviewed and approved by BNSF. The solution selected was to lean the reinforcement cages enough to line up the column reinforcement with the bent reinforcement. The diameter of the column was also increased to maintain the minimum amount of concrete needed over the cage. This allowed the concrete column to be poured plumb, which didn’t impact the aesthetics seen by the public. This solution was quickly approved by BNSF and constructed. The project was recently awarded the APWA Southern California B.E.S.T. Award for Transportation Project of the Year. In addition to the functional improvements provided by the new grade separation, the project provided an opportunity to enhance the aesthetics of the corridor through the rail crossing. The project include a landscaped median, decorative retaining walls and bent caps, and attractive and safe lighting in the underpass for bikes and pedestrians. The City of Fullerton and Orange County Transportation Authority were selected for an ASCE OC project of the year award for the State College Grade Separation. This project $86 million (total cost) project lowered State College Boulevard under the BNSF Railway line. The project improved safety and mobility at a heavily used rail crossing. The City of Fullerton and Orange County Transportation Authority were selected for an ASCE OC project of the year award for the State College Grade Separation. The $86 million (total cost) project constructed a new roadway underpass at the intersection of State College Boulevard and the BNSF Railway. The roadway was lowered between Santa Fe Avenue to the north to approximately 500 feet south of Valencia Drive to the south. The tracks are carried on a 2-span 113-foot long, 60-foot wide undercrossing with concrete precast box girders and steel plate deck. The project required extensive utility coordination and relocation of 12 different facilities including water, sewer, drainage, and telecommunications. The underpass greatly improved safety and traffic operations at the rail line that carries more than 70 trains per day. Vehicle, bicycle, and pedestrian traffic is physically separated from the high train volumes. This eliminate the potential for collisions with locomotives. The removal of the at-grade crossing improves traffic conditions and reduces delays. Vehicles no longer need wait at the gates for the multitude of long trains to cross the roadway. Similarly, emergency services response times are improved with the elimination of the crossing.